Avenue Web Media specializes in advanced Drupal development. From small to large, and from simple to highly customized, our experienced team of Drupal developers can turn any web project into a successful Drupal website. We hold ourselves and all aspects of our work to very high standards… the AWM standards. Every website we build is subject to our rigorous quality assurance process in order to guarantee the highest level of quality, flexibility, reliability and compatibility. An AWM Drupal website is done right from every angle. Drupal is an award-winning Content Management System (CMS) and development platform, designed to push the limits of what can be done with a website, while minimizing costs and timeframes. Using Drupal, a small team of professional web developers can quickly produce attractive, robust and flexible websites with all sorts of modern features that far exceed the capabilities and reliability of other competing technologies. To learn more about Drupal: Why Drupal?, Who is Using Drupal? Our expert graphic designers produce amazing web designs and graphics. You can rely on our team to build the unique look and feel of your new Drupal site or revamp an old site. If you already have a design that needs to be ported into Drupal, our team can turn any graphic design into a professional Drupal theme that fully integrates with your site, without leaving behind any of the design’s intricacies. Learn more about our Custom Drupal Themes and our PSD to Drupal Theme services. Although the Drupal module repository offers a large array of modules to choose from, your specific project may require customizing existing modules or developing new ones tailored to your site. Our experts will help you identify what functionality already exists, how much of it we can use reliably, and what else needs to be done to either bring unsatisfactory modules up to standards, or create new ones to satisfy your requirements. We know Drupal. Most importantly, we know that web projects can be complex and challenging, and it takes a lot of work and knowledge to get all the pieces of the puzzle under control and working in harmony. Our Drupal professionals can provide expert answers and guidance at all stages of the development process. We specialize in providing a hassle-free effective solution, so we deal with the specifics concerning software, installation, security, bandwidth, storage space, etc, so that you don't have to. Our technicians will evaluate your hosting needs and offer you the plan that is exactly right for you. We have the capabilities to place small sites on efficient shared hosting servers, medium-sized sites on optimized VPS servers, and large sites on high-capacity dedicated server arrays. To read more about the technology behind our servers, visit About Our Web Hosting. If your site currently uses Drupal, it is important to keep it up to date with the latest security releases and feature updates. However, it is not always necessary or possible to upgrade as soon as a new version of your Drupal modules become available. Our team of Drupal experts can help you determine whether you need to upgrade, find the best upgrade route, and bring your out-dated custom modules and themes up to speed. A Support and Maintenance agreement ensures that your team has access to professional Drupal knowledge on-demand when most needed. Our experienced support staff can answer day-to-day questions and assist with content management and training, while our development team can assist with fixes as well as design changes, site configuration and even adding new features. 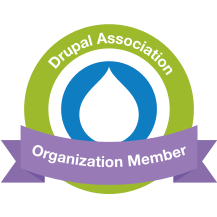 Read more our time-based Drupal support. Contact us now for a quote, or read more about our standard website features and the way our company works.